I like to think of eggs as a base for other ingredients. Kind of like rice in Chinese cuisine, or pasta in Italian (that’s remembering my pre-low-carb days, of course). In this post, we will look at scrambled eggs – how to make the basic version, and how to then jazz it up into something exciting. Is it worth the bother? Yes, there are some very good reasons to master the scrambling eggs. Cooking doesn’t get any easier than scrambled eggs. Just whack the eggs into a frying pan and mix with a spoon. That’s pretty much it. It takes about 3 minutes in total to make scrambled eggs. OK, maybe 5 minutes if you are adding lots of extra ingredients. Eggs are naturally low in carbs – about 0.5g net carbs per one large egg. Eggs are a great source of high-quality protein and fat (about 6g each in a large egg), as well as vitamin B2, vitamin B12, vitamin D, selenium and iodine. 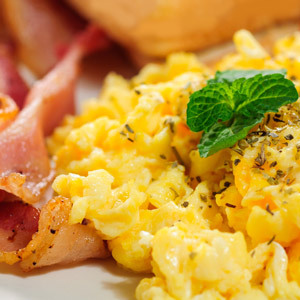 Plain scrambled eggs make a good base for adding other ingredients, like smoked meat and fish, veggies and spices. Eggs are good value for money. You can get half a dozen of high-quality free-range eggs for around £2.50. Getting the best quality eggs is crucial. Free-range and organic option is well worth the extra money. Eggs aren’t expensive anyway, so it won’t break the bank. But your breakfast will taste much better. Whereas if you use mediocre eggs, nothing will help. Scrambled eggs process starts with gently melting some fat in a frying pan. Butter is the traditional choice. Coconut oil works wonderfully too. I use about a walnut-sized scoop for six eggs. Some people advocate adding cream to the egg mixture. This result in richer and creamier mix. But the taste of eggs gets a bit overwhelmed. Watch your eggs as you cook them. Take the pan off the heat while they are still a little bit runny. They will continue to solidify for a bit longer. All you need is eggs, fat (like butter or coconut oil), salt and pepper. I tend to use 6 eggs to make breakfast for two people. If you want to make it even simpler, crack your eggs straight into the frying pan, and just mix them like mad. 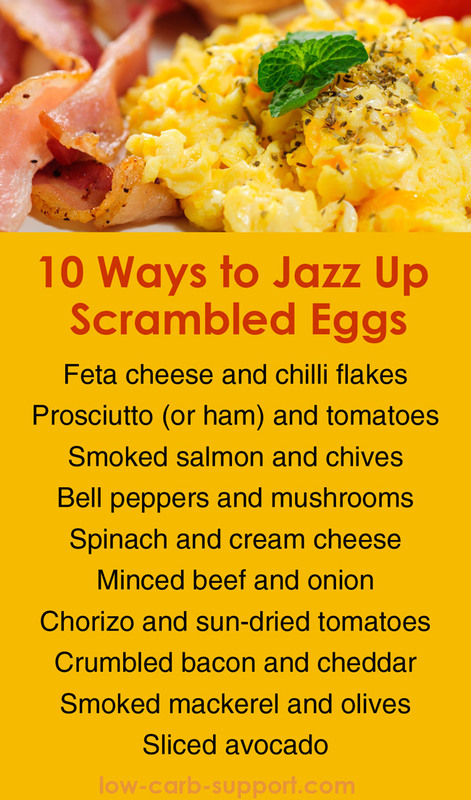 If you get bored with plain scrambled eggs, jazz them up with toppings. Add chilli flakes to the butter in the beginning, so they cook a little bit. Add crumbled feta just before taking the eggs of the heat. Slice ham into tiny slivers, and mix in just before taking the eggs of the heat. Serve tomatoes on the side. Slice thinly and mix in with your eggs in the very end. Or serve the salmon on a side. Fry peppers and mushrooms separately for several minutes. Add to ready scrambled eggs and mix. Add both half-way through while cooking the eggs. Add both on top of cooked scrambled eggs. Slice avocado, season with pepper and salt. Serve as a side for eggs. Do you need more low-carb breakfast recipes?